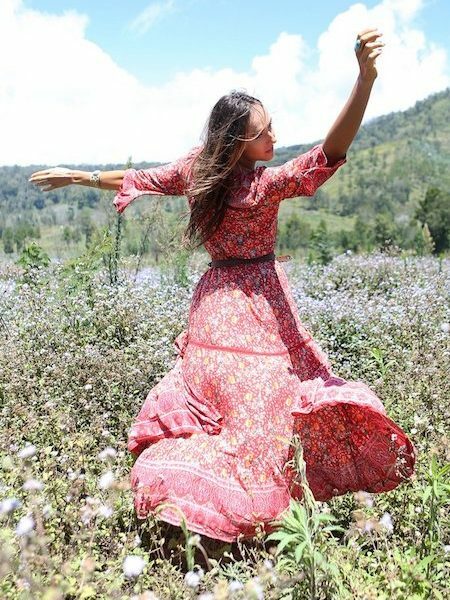 The Dahlia Mini Frill Dress is a dream come true for all our Bohemian Romantics! This vintage Goddess inspired piece with gorgeous batwing frill sleeves has that dreamy vintage feel. Featuring a soft elastic waistband, the Dahlia Mini Frill Dress gives you that stunning feminine silhouette falling beautifully to knee length. It has the most beautiful cut out back featuring a neck tie at its back with our signature wind chimes tassels. This stunning mini dress, printed by hand with incredibly delicate floral print details, is made from our super soft lightweight rayon and flows and ripples as you walk. Available in three gorgeous colours, Plum, Blue Jewel and Primrose Pink, the striking Dahlia Mini Frill Dress will have you feeling like a Goddess. Looks great teamed up with a vintage pair of boots or your favourite sandals.